TeeSpring is a unique website that uses crowdsourcing to sell tee-shirts. It works by having the designer set a sales goal to reach for each tee-shirt, and if that goal is reached then the tee-shirt is printed and sent to the customers. This means that if a goal of 100 tee-shirts is not reached, the tee-shirt is not printed and nobody has lost out. The customer doesn’t have to pay anything, and the designer doesn’t have to pay anything. However when a goal is reached, the tee-shirt is printed and sent to the customer. Tee-spring takes a cut and the designer gets a piece of the profit. The unique idea of this business is that each tee-shirt is crowd funded and doesn’t cost anything initially to set up. You can go to TeeSpring right now and set up a tee-shirt to sell for free. You can set a goal as low as 5 tee-shirts, and if just 5 are sold, then you will be making profit. You just need to find five people that want to wear this tee-shirt and you are making money without any initial investment. Tee-spring works because its a win-win-win idea. Its free to set up, and the designer wins, the customer wins and of course Tee-spring wins. To create a design on Tee-spring is easy. They have a built in designer where you can add many images or texts and create a great looking tee-shirt in minutes. You also have the option to import your own images so you can get a professional designer and craft a great looking tee. You can choose from multiple colours and even have several colour options within just one design page. You can offer hoodies, male and female tees, and a variety of qualities and other types. Once you design your tee-shirt you set your goal, which can be as low as 5, and then set a completion date for this project. (think Kickstarter) Then the tee-shirt goes live and you are given a page where the tee-shirt is sold. You simply need to spread this page around to your family, friends or any groups you know that would like the tee, and you will be off. Making the first few sales is sometimes the hardest, but if you know people then you will be able to reach your goal with no problems. Many marketers have adopted this easy to start business model and used ads to increase their revenue. With Facebook ads you can target specific audiences so you can design a tee-shirt that is perfect for that audience. Say you find the audience of males who love rollerblading. You can create a tee-shirt that shows off a rollerblading man, and add a relevant slogan. 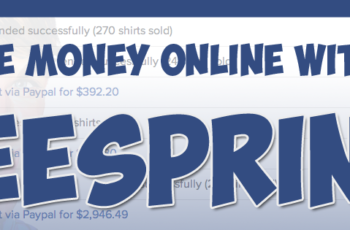 Then setup this tee-shirt for free in tee-spring and run some Facebook ads to the page. Since the traffic is so targeted you are likely to make sales. This method does require some testing and since you are paying for advertising, it stops becoming free. If your tee-shirt doesn’t reach the goal then the advertising revenue would have been wasted, however when you hit on a winner, you can scale it up as much as you want. When selling tee-shirts with advertising its important to constantly track your ROI (Return On Investment). You have to know exactly how much you are spending, and how much you are making. If you know this much you can track your ROI. The better you get at tracking your ROI, the faster you will know if a tee-shirt is profitable and if you can scale up advertising revenue. There are many online ROI calculators that can be used to track this. The best way is to create an excel file with all the ads, tee-shirts and various projects, and keep a track of the ROI throughout different campaigns. As the brand grows it becomes even more trustworthy, and people are more happy to buy from them knowing that they will get quality unique tee-shirts at amazing prices. In conclusion, Tee-Spring is a brilliant innovation that works for designers, marketers and tee-shirt customers. Since no one looses if a tee-shirt is not printed, and everyone wins if it is, it’s the perfect solution. There is no need to spend upfront money on printers and designers and all the rest, instead, just setup a free campaign in tee-spring and see if it sells.